I thought it would be fun to start a new recurring series that highlights all of my favourites in skincare, makeup, aromatherapy, books, food, or whatever else really stood out to me during the month. And since February is coming to a close, and I have tried a LOT of products over the last 28 days, what better time to start! Now, this isn't everything I have used (you can see all my empties in a few days! ), nor is it everything I found fantastic, but it is a great rundown of brands that I discovered and love, items that surprised me, and products that have really made a difference. 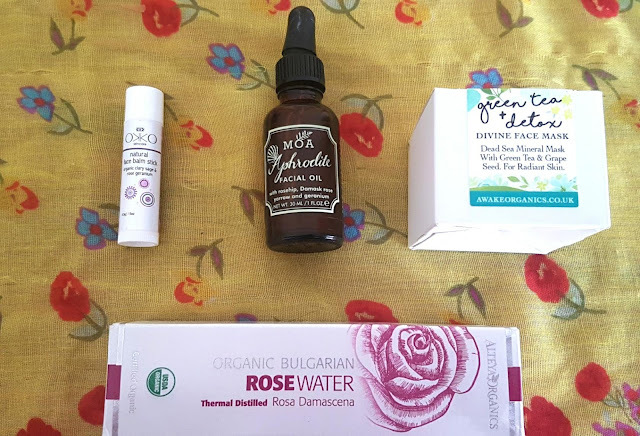 I love me some floral sprays, and rosewater is definitely a staple in my beauty cupboards. This organic spray from Alteya Organics is not only 100% pure thermal distilled rosewater, but is super affordable which is great seeing how much I go through! Also, they offer large bottles so you can refill your own at home, and have started doing bio glass packaging so you can go plastic free. Ingredients: 100% pure organic steam-distilled Rosa Damascena floral water. I have mentioned this oil before in my MOA Brand Spotlight, and my thoughts on it remain the same -- it is simply gorgeous. My skin has been extra glowy and clear since I started using this, and I have really grown to love the smell. Plus, the oil is not too heavy on my skin which is perfect as I have had to use a different product on my chin with some other oils I have tried in the past. 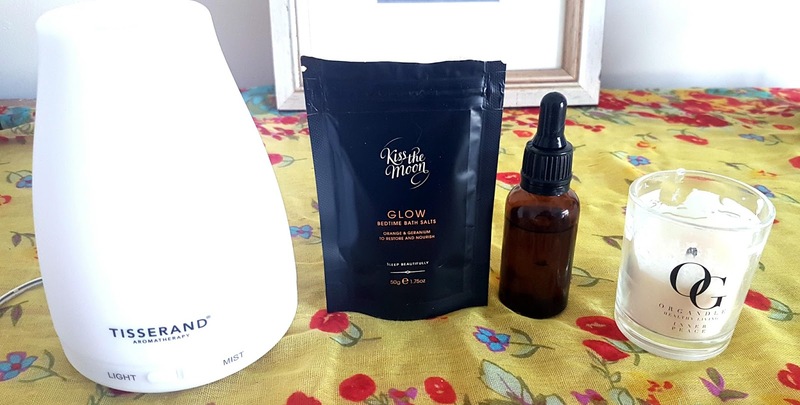 I love that this face oil comes in a dark glass bottle (see why here) and has a little dropper to apply, as this makes it so much easier to control how much product you are using. I have so many face oils to use still, but this will definitely be a re-buy when it comes time. If you missed my post about this face mask from Awake Organics, you won't have heard me rave about how divine this truly is. My skin is prone to breakouts when I use most face masks, but with this one my face is so soft, smooth, and healthy afterwards with no spots in sight, even the next day! It smells good enough to eat, a mix of frankincense, geranium, and matcha, with undertones of all the other lovely botanicals included in the formula. This has quickly become a weekly ritual, and I highly recommend as both a detox and as a radiance boosting treatment. P.S. Grab 15% off your first purchase over £14 from Awake Organics (excluding shipping and taxes). Ingredients: Unprocessed Pure Dead Sea Mineral Mud, British Raw Honey, *Cannabis Sativa (Hemp) Seed Oil, Limnanthes Alba (Meadowfoam) Seed Oil, Natural Bentonite Clay, Camellia Sinensis Leaf (Matcha Green Tea), Vitis Vinifera (Grape) Seed Extract, Essential Oils of *Boswellia Neglecta (Frankincense) Oil, *Daucus Carota (Carrot) Seed, *Pelargonium Graveolens Roseum (Rose Geranium), Non-GM Helianthus Annuus (Sunflower) Seed Oil, ^Limonene, ^Citronellol. (*Organic, ^Naturally Occurring). This convenient little multi-purpose balm came in two of my amazing subscription boxes this month (The Cruelty Free Beauty Box and The Natural Beauty Box) and I could not be happier to have two of these 'try me' size sticks. I have the Geranium and Clary Sage scent which is so relaxing and lush, and I have been really happy with how the balm works - it is not too heavy when on, nor very oily. I tend to use this on my forehead and random dry patches, and those areas have been loving the extra TLC. 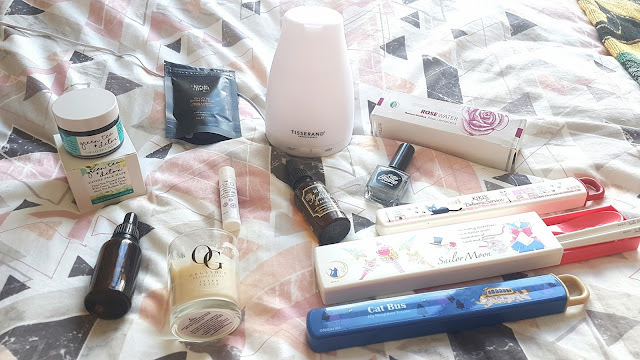 When I was trying to figure out what to spend my Boots gift voucher on, I discovered they carried one of my favourite aromatherapy brands, Tisserand. I lucked out and got the very last one in stock in all of Norfolk, only to find out they had placed a defective machine on the shelves. Luckily, Tisserand reached out to me and when they discovered my diffuser wasn't working, they offered to send me out a new one - talk about amazing customer service! And I am SO thankful that I did get a replacement, as this machine is game changing. Not only does it act as a quiet and effective diffuser, it has various colour changing options you can set to make the room the ultimate spa retreat at home. I will be talking about this Spa Diffuser again in the next week or so, so keep an eye out for my Tisserand Brand Spotlight -- coming soon! You can read my full rundown of these bath salts on my Kiss the Moon Brand Spotlight, but the short version is that they are totally dreamy. I have only recently gotten into bath salts, and I am so happy that I finally decided to give them a go - they really do help release muscle tension, and the Kiss the Moon formula also helps with radiant skin and to clear your mind and get you ready for a stress-free sleep. I discovered Organdle in January, and after following them on social media for a while I decided I absolutely HAD to try their products ASAP. I ended up buying several of their brand new wax melts as well as the mini-candle gift set, as I wanted to try out every one of their signature scents. One of my favourites so far is Felicity: Inner Peace, as it is so incredibly calming and makes my stresses float away. Organdle's products are all ethical, vegan-friendly, non-toxic, and use only high quality natural and organic ingredients -- total win for me! Definitely keep posted on this oil, as it is proper magic in a bottle. I was lucky enough to get a sample to trial, and I have found it has been another game changer for me this month. The oil is geared towards women who suffer from chronic cramps, PMS, and other prevalent menstrual symptoms. The blend of carrier oils and essential oils smells amazing, with the bergamot, chamomile, geranium, and clary sage coming through strongest. When applied directly to the skin it seems to instantly start to sooth the area, and I have genuinely never experienced anything like it. I have also tried it in the bath (huge success!) and in my hair (brilliant!). As soon as this is released I will definitely be a permanent buyer. I have been loving this 'Radiance' glitter polish from Little Ondine, as it has little flecks of holographic glitter in the clear peel off formula. Not only is it stunning, but it is also non-toxic, 9+ free, vegan friendly, cruelty free, and is composed of mainly water, mineral pigments, and resin. I have a few other glitter polishes from this brand, and since I love 'Radiance' so much I am definitely looking to branch out and try even more! Okay, so this is probably the 'odd one out' compared to the rest of my post, but I really felt I had to share these as I just love them so much! Something you may not know about me is that I am a huge fan of anime. I grew up watching Miyazaki films and Sailor Moon, so when I found these back in December I was desparate to buy them. They took ages to arrive, but boy were they worth it. 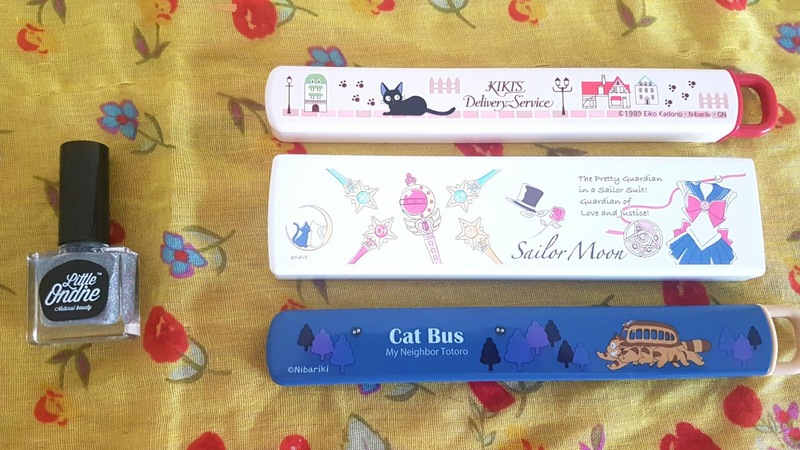 The cases are really sturdy and the designs on the front of all of them are perfect -- I chose a Sailor Moon set, a Kiki's Delivery Service set, and a Totoro set. The chopsticks (and in the case of the larger set, the added spoon!) fit snugly inside, making them perfect to carry around on the go, and they are super easy to wash. We make/eat a lot of Thai and Japanese food, so this was the perfect purchase for me. Loved reading this so many amazing brands!! A great round up of products. I'm loving the idea of the Tisserand diffuser. I was in a spa recently and they had a diffuser, was wondering how I can get my hands on one. Would love it, especially when I'm working. I really need to try that face mask from Awake Organics, it sounds really good! I love face oils and have recently incorporated it into my skincare. It's great the the MOA Aphrodite Oil leaves the skin nice and glowy. I might have to try the detox face mask as my skin is prone to breakouts too. I love the sound of the Organdle candle, can't resist trying new candles at this time of year. I love the sound of the Rosewater, Rosewater is really under appreciated I find! Also the Spa Diffuser sounds lovely! I'm becoming obsessed with blending oils for the diffuser - my best buy of 2018 so far! I really love the sound of the bath salts, they sound the perfect way to relax after a stressful day. Do you know if the brand is cruelty free by any chance? Every brand I write about is cruelty free and natural :) and most are vegan as well! I so want to try that tummy oil. Organdle is not a brand I have heard of before but their products sound fab.